The Paper Retriever Program offers a community based fund raising recycling service to non-profit organizations such as schools, churches and civic organizations. 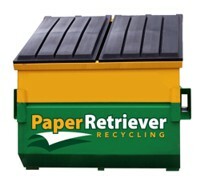 For qualifying organizations, Paper Retriever provides its green and yellow recycling bins to collect newspaper, catalogs, magazines, junk mail, office paper, school paper, notebooks and folders. We pay our non-profit partners for paper collected in the bin. The more you recycle, the more you raise! Please contact Resolute Forest Products for more information at 800-531-6752. Speedy Shred is a local business offering document shredding and recycling locally for both businesses and residents. Contact Speedy Shred at 812-376-6364 or 877-376-6364. Bartholomew County residents and/or businesses who do not receive City Department of Public Works services can sign up with one of the local waste haulers for refuse collection.